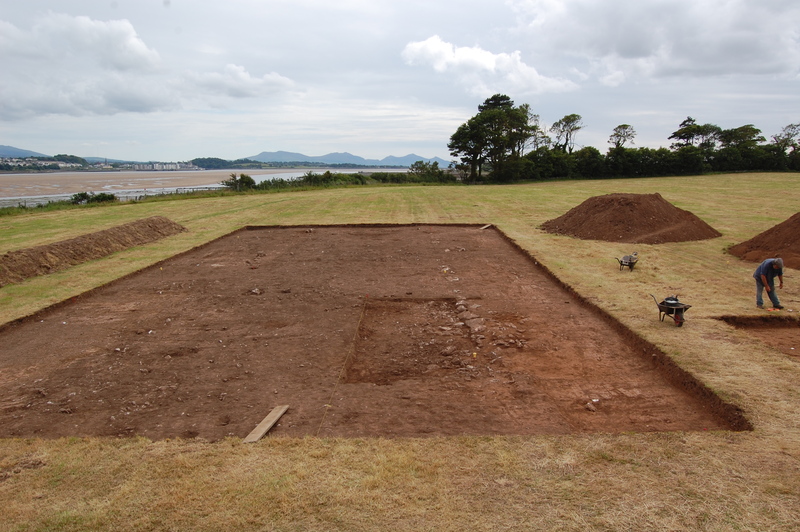 As part of the Tai Cochion archaeological project, Gwynedd Archaeological Trust will once again be excavating on the banks of the Menai Strait between the 27th of June and the 5th of August. 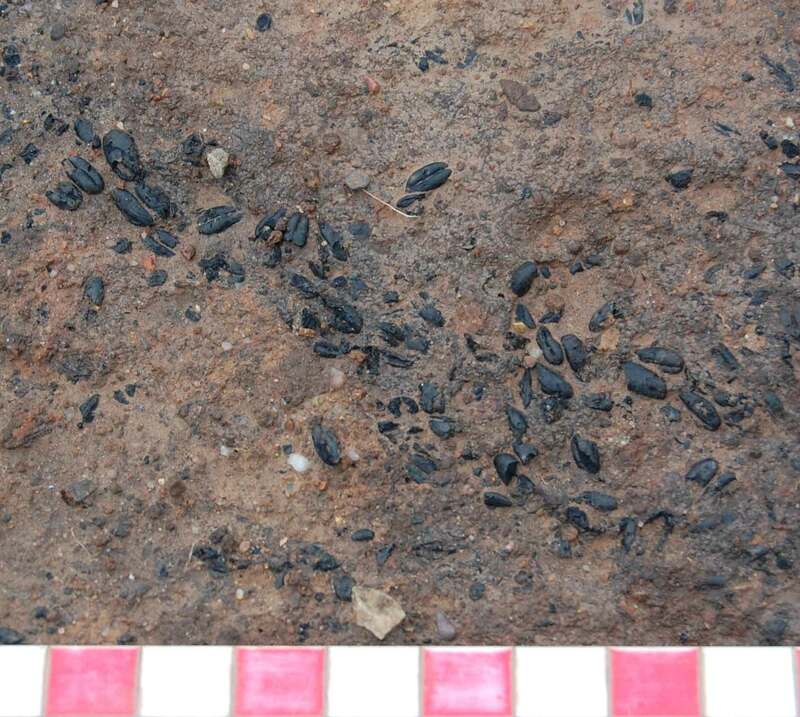 The site was initially brought to our attention by finds reported by members of the public. This was followed by geophysical survey which identified features extending over a wide area. 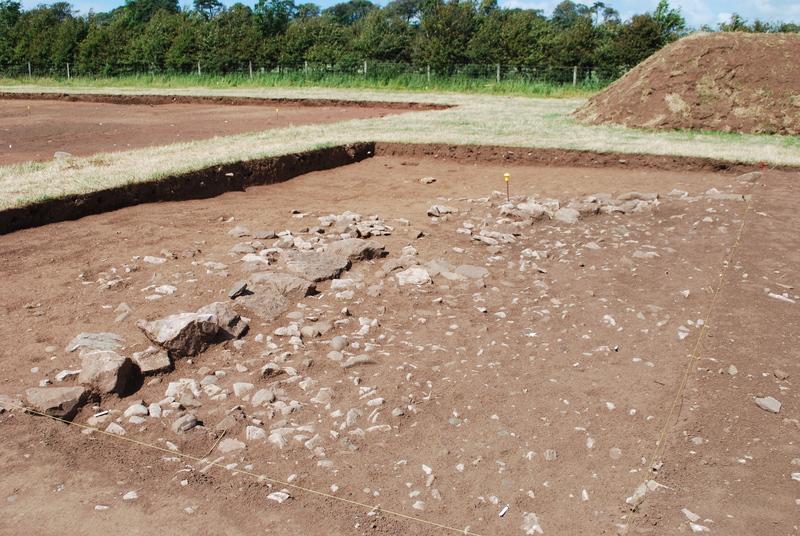 A short excavation in 2010 revealed a road, building and ditch feature dating to the roman period. 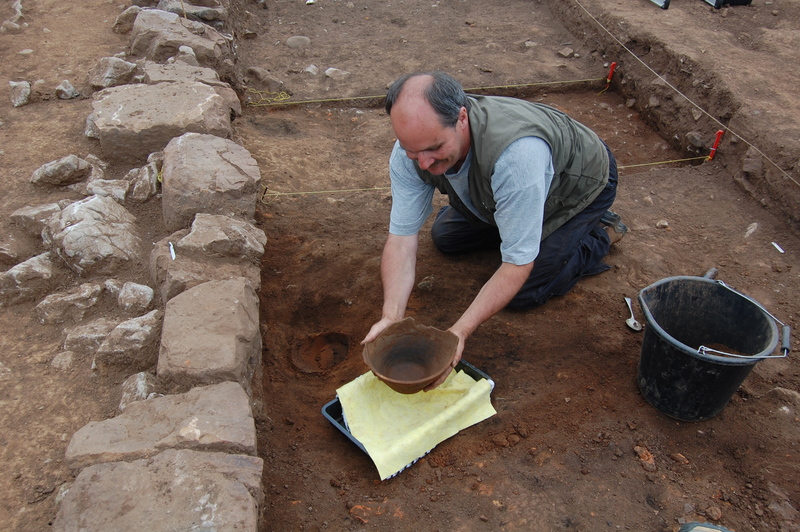 Artefacts discovered during excavation showed that the site was occupied from the 1st to 4th century. 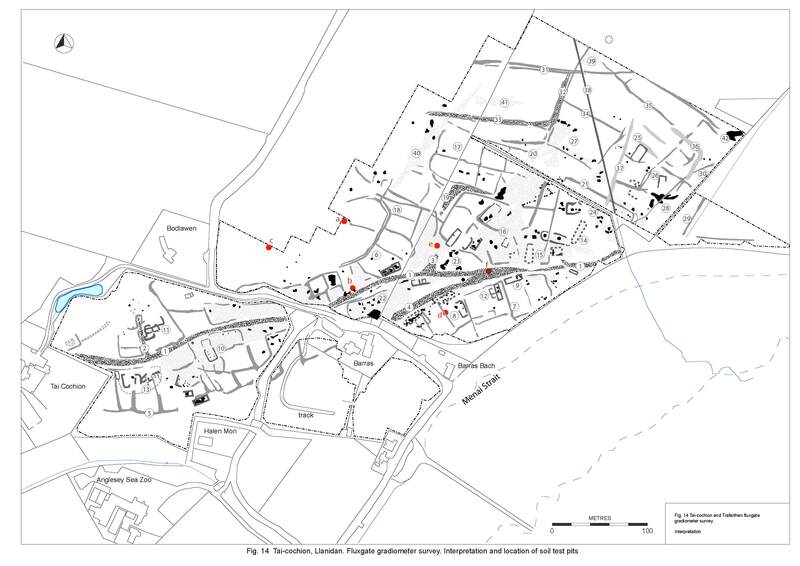 This year, with funding from Cadw we hope to discover more evidence as to the nature of this settlement. 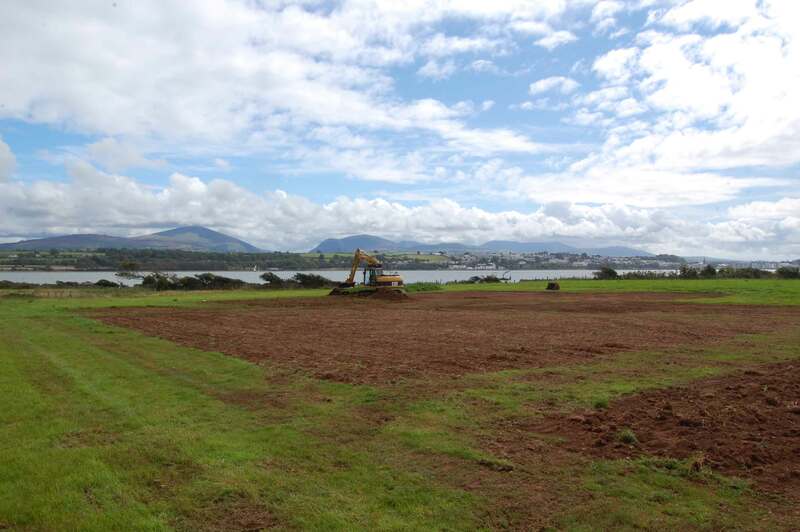 The excavation aims to examine two areas close to the Menai Strait, one containing a building and the other some possible industrial features. 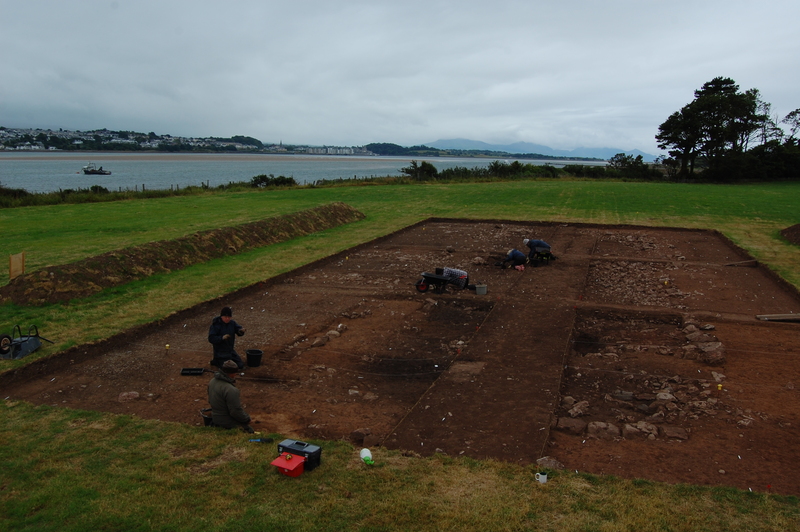 This year Tegid Rhys Williams, the CBA Community Archaeology Trainee, is keeping a dig diary. The long awaited first day of the dig! Dave, the Site Director, has finished surveying the site and laid out two trenches based on the Geophys over a building and some possible industrial features. This was my first day on site. The digger had arrived and the topsoil was removed using an 11 tonne tracked excavator. It was difficult to get the exact level correct. Too much removed and we damage the archaeology, too little and we have an extra week’s hand digging! Two trenches, one 30x15m and the other 25x20m, were excavated by the digger. We also have a little one for the school kids who will be visiting the site during the next few weeks. Volunteers on site for the first time – lots of health and safety inductions plus paperwork to be filled – finally started trowelling! There’s a great team of volunteers including students, ex-archaeologists and complete beginners (I fit into the latter!). Wasn’t on site today but got the entire lowdown from Dave. A good trowelling day, but, as yesterday, the ground is very dry and hard. Trench 1 containing the building is going to be hard work because we couldn’t take off as much topsoil because of protruding stones. Trench 2 is going well but looks to be more complicated than shown on the Geophys. Again, I wasn’t on site today but Dave seemed quite happy when I spoke to him. Amazingly, we’ve finished the first trowelling over at trench 2 and it’s ready to be recorded – Dave is hoping that it doesn’t rain too much tonight. Trench 1 is progressing well. There is definitely a building and it’s big too – about 25m long. Rain at first but not enough to soften the soil for long. The footprints of the walls of the building in trench 1 are becoming clear – strangely the ends of the structure seem to be rounded. Dave and Jeff recorded trench 2 using a series of 66 overhead vertical digital photographs – Dave stayed up until half past midnight joining them together on Photoshop! The first school arrived on site today. Anita, Iwan and I had a busy day – did a bit of trowelling with the kids in their trench, showed them how to work a Groma (some with more success than others, not naming names!!!) and did some Roman signalling with flags. All the children seemed to have had a really good day. Everybody was in trench 1 today while Dave assigns context numbers to features in trench 2. The walls of the building are getting clearer – stone foundations with a wood and wattle and daub superstructure. The second school was on site today, although the children had to leave at lunch time unfortunately. Still had time to do some trowelling, talk about some finds, and sing happy birthday to Iwan!! The day began with rain which was really needed as it helped loosen and soften up the ground. 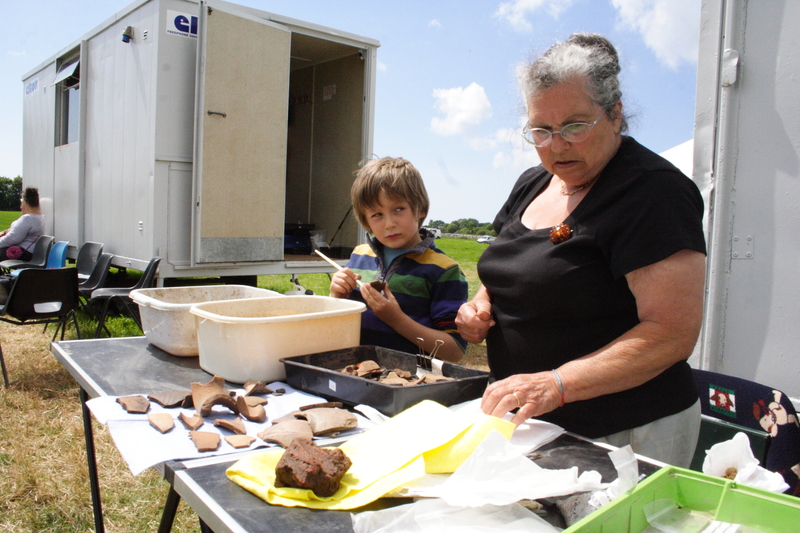 The rain stopped at about 10am and the sun came out for the rest of the day – a good day for fair weather archaeologists! There were 16 volunteers on site today and all of them were working on trench 1. Lots of progress was made on that trench today. The west wall is really clear to see now. The east wall is still a bit confusing but Dave thinks that it could be a veranda. Trench 2 much clearer after the rain – the plans have all been finished. 12th form students from a local school came to visit the site today. 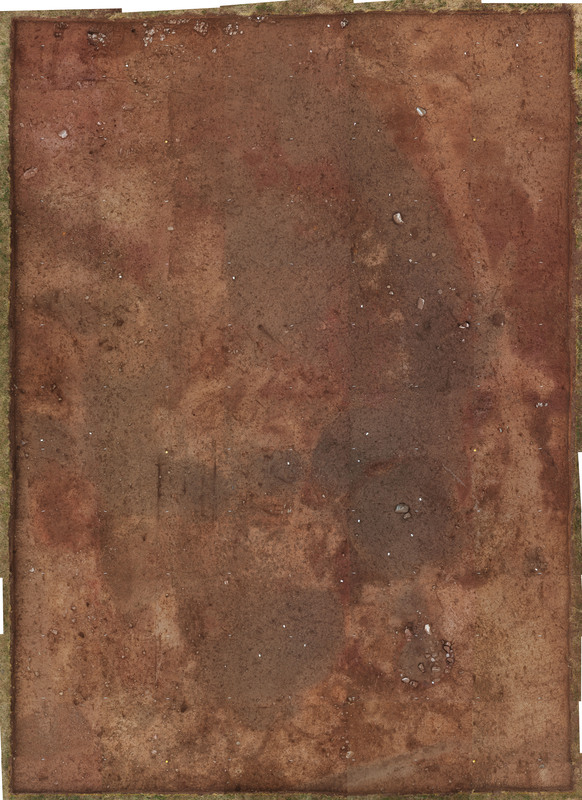 Did a bit of trowelling, did some experiments to see the science behind geophysics, and what seems to becoming the highlight of the day – for Iwan and me at least – Roman flag signalling. Rain stopped play for long periods today, which stopped the volunteers from digging much. There were spells when the rain disappeared for a while, but the rain definitely held us up. The volunteers went home at 4pm because the heavy rain made it difficult to work. A long weekend then! Year 8 pupils from a local secondary school came to the site today. Luckily, the rain didn’t affect the activities too much as most of them were done in our tent. A beautiful day on site, and it was very warm. The volunteers had a really good day in the trenches. 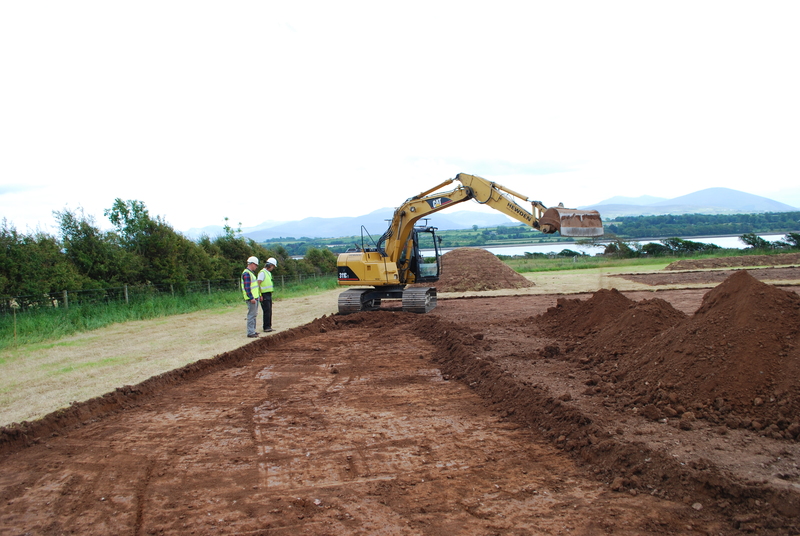 In trench 1, the bottom layer of the topsoil was taken off which cleaned the top layer of the building. This revealed walls, floors and doorways. Also we have found a lot of burnt wattle and daub. 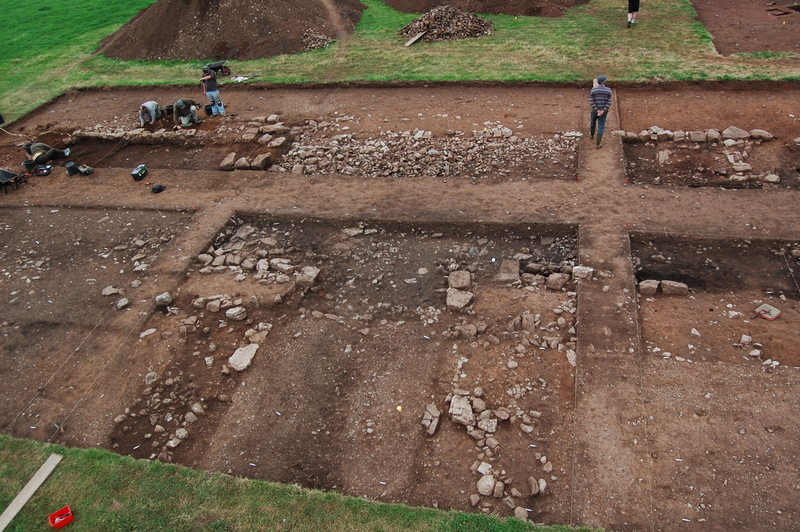 In trench 2 work began on cleaning two or three features in order to define them a bit better. Dave said that after work is done this afternoon, he was going to begin to do some sub-sections. Another primary school came to the site today. The kids and the teachers all seemed to have enjoyed being archaeologists for a day. Even though it was stunning day, I learnt a lesson that wearing yellow is not a good idea on such a hot day – flies loved my T-shirt. Another stunning day on site again today and the volunteers have being working very hard. In trench 1 the volunteers have dug down to the demolition layer across the whole of the trench. Further investigation has revealed that the building seemed to have been burnt down. In trench 2 the rest of the team sampled 4 features which have turned out to be Roman. Two local primary schools came to see us today. Even in boiling weather, all of the kids worked really well in the activities arranged for them. The beautiful weather doesn’t want to leave north-west Wales. Bright warm sunshine all day. Great for Anita, Iwan and me, who had another two primary schools visiting us today. 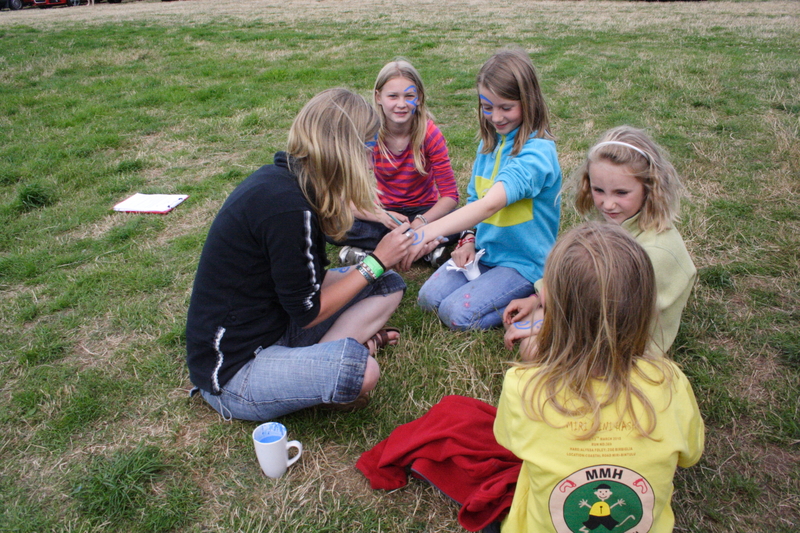 All of us loved being outside doing some trowelling, the groma and flag signalling. After the kids left the site I got an update on what was going on in the trenches by Dave. In trench 1 the floor of the building is still not found – it seems to be very deep and below the level of the wall. In trench 2 one of the features seems to be a deep ditch. 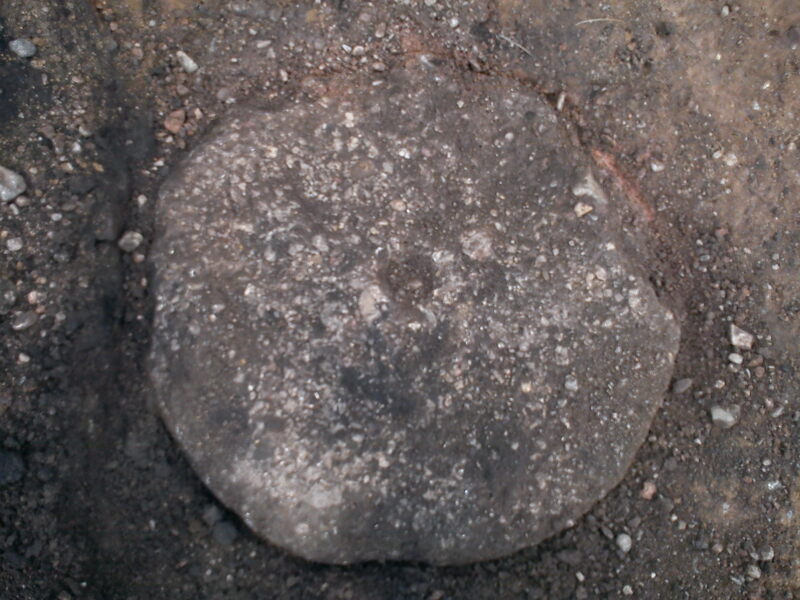 Another is a well-built circular stone feature – perhaps an oven. Also Dave has being giving training to a few volunteers. The training for Hi-res geophys showed up a rectangular building. Another warm, sunny day on site. Good progress made in both trenches by the volunteers. The last school visit was today, pupils and teachers seemed to enjoy. I wasn’t on site today but according to Dave the rain came down quite heavily during the day. However the volunteers still managed to get some work done in the trenches. Makes a change to the warm sunny weather we’ve had the last few days!!! I wasn’t on site again today but I’ve had a quick chat with Dave to see what’s been happening on site. In trench one the volunteers have been working really hard, and by now the floor of the building has finally been reached. In trench 2 the circular feature that I noted last week has been excavated, Dave seems to think that it’s possibly an oven or a grain drier – the feature is deep, well built and stone lined. Work is also continuing on the other features. I wasn’t on site Tuesday, but I was able to get there for Wednesday. 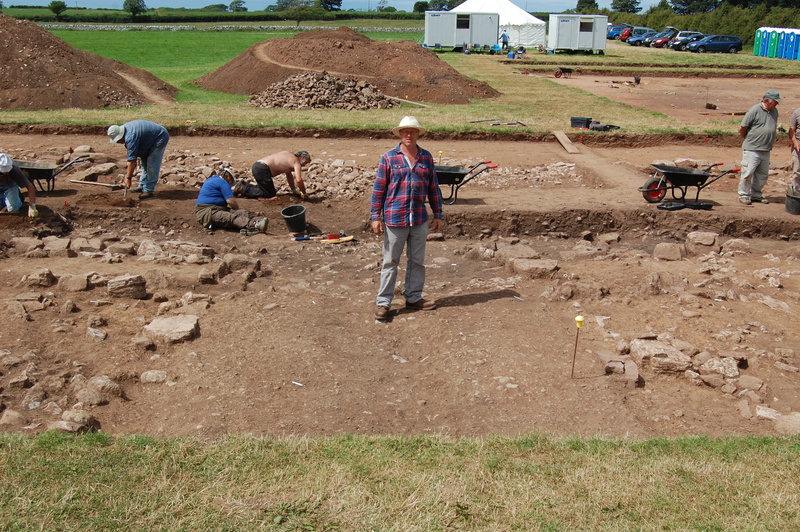 Dave told me that they have discovered a wide, grand entrance to the building in trench 1. It’s now starting to appear to be a high status dwelling, perhaps with a veranda along the front. In trench 2 the digging and recording several features continued. On Wednesday the Bangor branch of the Young Archaeologists came to visit in the morning, and all of them had a go on doing a bit of digging. Again, I didn’t get to site on Thursday as I was busy preparing for the Festival of British Archaeology Tai Cochion open day on Saturday. Iwan and I did get on site for Friday, but this was a flying visit in order to do some last minutes preparations for the open day. I had a quick chat with Dave while I was there. 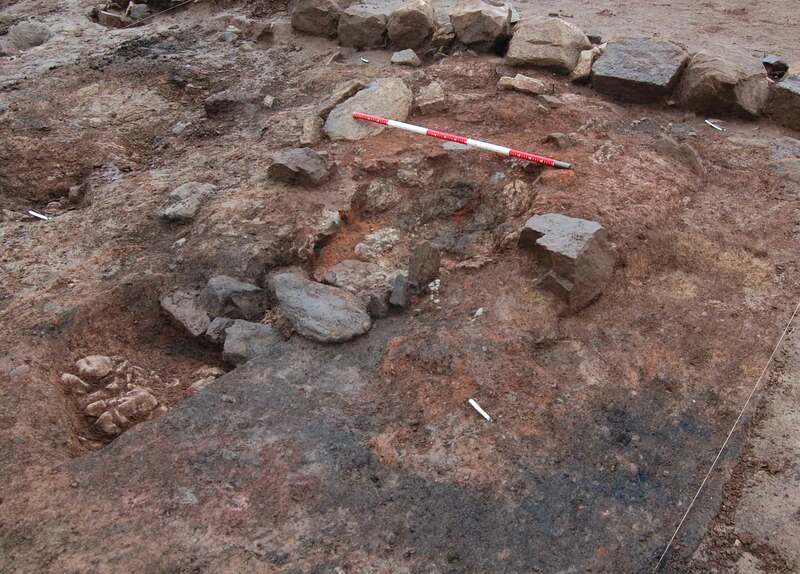 The oven in trench 2 has been further excavated and appears to be a grain dryer. Fresh looking pottery shows that it was Roman. In trench 1 worked continued on the building. 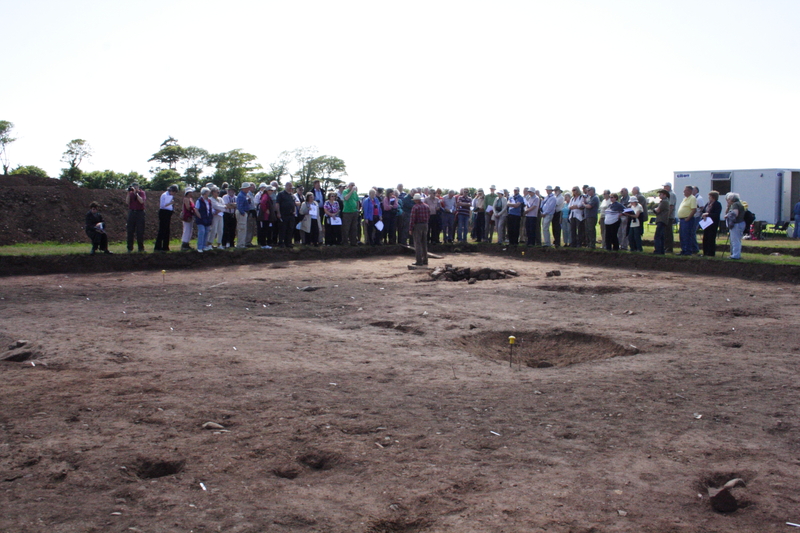 Tai Cochion Excavation Open Day! Weeks of organizing and preparing for the event had been done by the whole team and on Saturday the day of the open day arrived – and it was a really good day!! We had over 500 visitors come to the site on a warm, sunny Saturday. And there were lots going on. 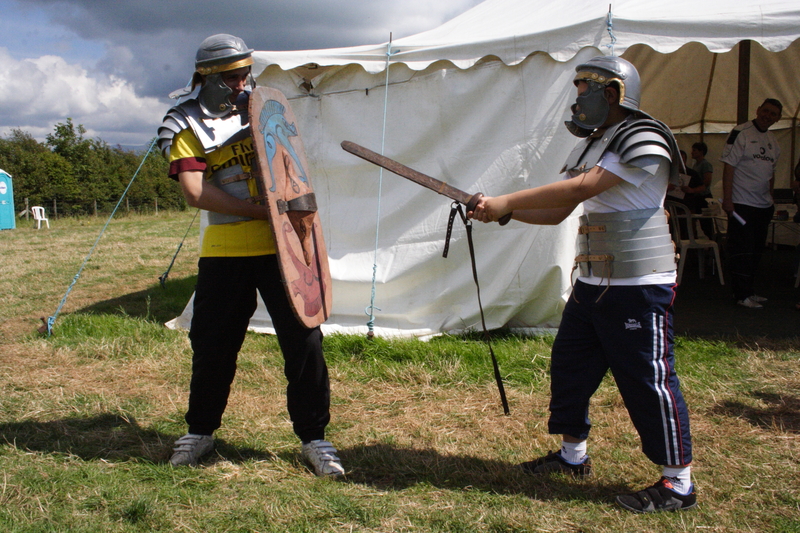 Dave and Iwan were very busy doing tours of the site all day, and there were loads of activities that the kids could do such as dressing up as Romans, try to reconstruct sherds of pottery, and get their face painted by Jess. Some of the volunteers also gave their Saturday up to do some work in the trenches, and during the day, the remains of a set of bronze scales were found. I just want to take the time here to thank everybody involved in the open day especially the Woodcraft Folk who ran the tea and cake stall, Pat and Ian from Oriel Ynys Môn, who were also involved in the open day with us, all the volunteers who turned up on the day, all the GAT staff for their hard work in the last few weeks and on the day, and to all the visitors who came along and made the day such a success. The volunteers are back on site after a deserved break over the weekend. In trench 1 the volunteers (including myself) have started of moving the balks from the centre of the trench, therefore a lot of hard work and tonnes of earth moved, and fair play it was very good work by the volunteers in sweltering heat. 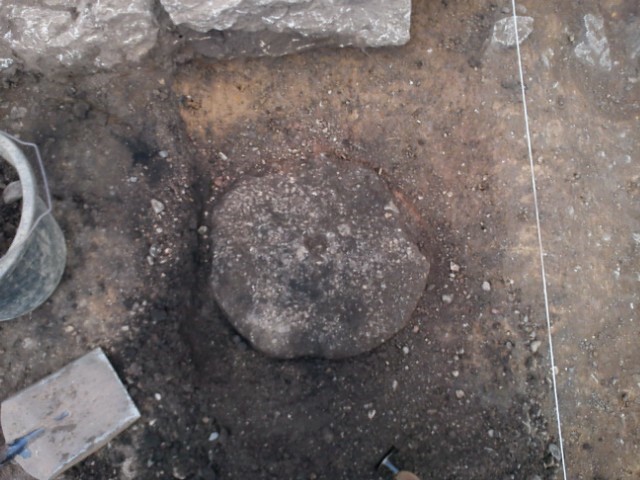 In trench 2 it has been difficult to find the flue of the oven. Because the earth is so dry it has been difficult to see it in the ground. Dave and Brian (the volunteer who is digging the oven) decided to wet the earth and cover it in tarpaulin, by the morning it could clearly be seen. Another warm day on site today. The work of digging the flue in trench 2 began today. 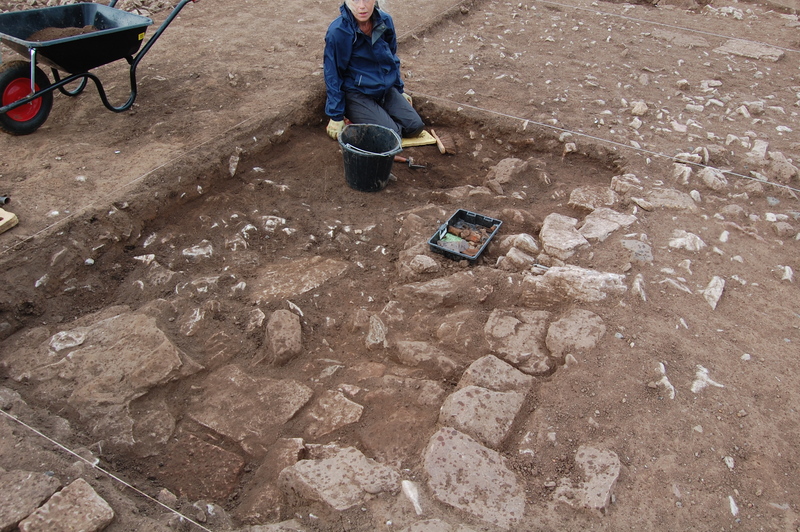 Also Iwan has started digging a fairly large area which looks complicated because there are many different features cutting into each other. The work of recording the other features continues. In trench 1 the work of cleaning the trench after taking the balks away began. After this was done Dave took photos in order to record it. I wasn’t on site today, but I had a quick talk with Iwan. There was some rain on site today which made conditions for digging perfect. Worked continued in both trenches. Another beautiful day on site and very warm. Iwan and some of the volunteers are still trying to untangle the features in trench 2. Also, the oven is starting to raise more questions; we will have to look closely at it next week to try to solve exactly what’s going on. In trench 1 the work of moving tonnes of stones and earth in order to find the floor of the building has begun, and there have been several interesting finds. Well, this is the last week of digging at Tai Cochion this year, but there is plenty to do before the digger comes to backfill the trenches. In trench 1 the work to reach the floor is well under way and most of the volunteers are now working in this trench to try and finish the job before Friday. 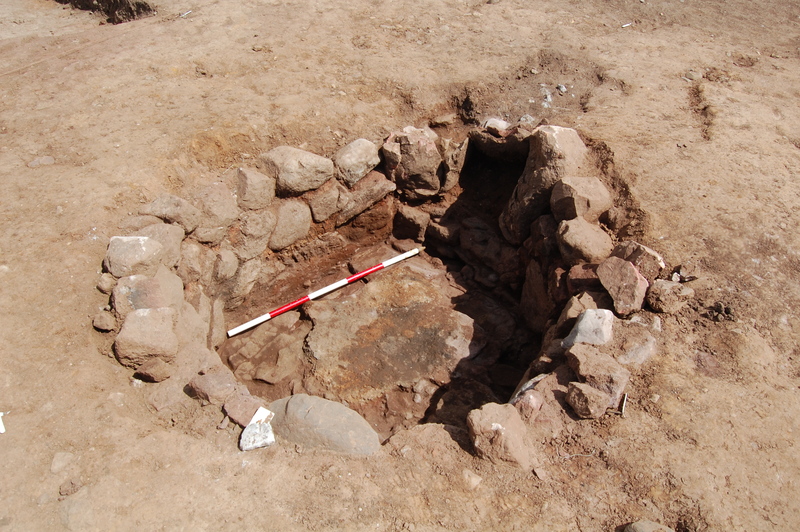 By the end of last week the oven feature in trench 2 was raising interpretation problems. 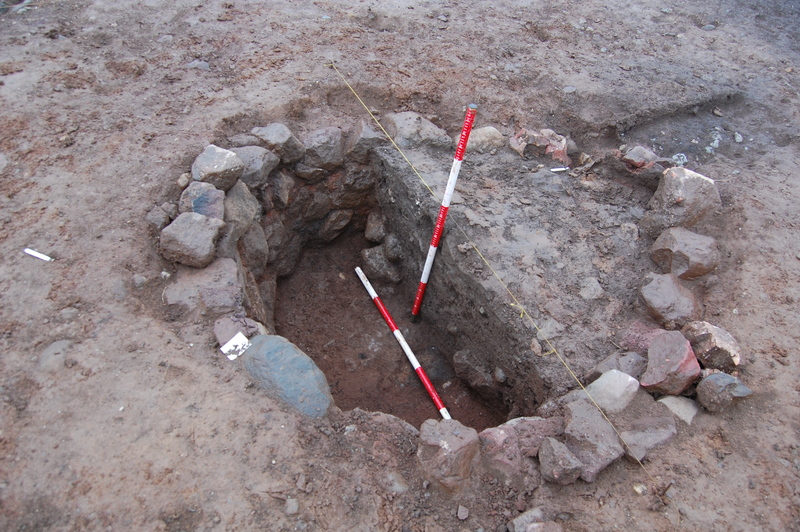 Iwan and Dave had a long discussion with Brian who has been digging the feature and they have come to the conclusion (for the time being at least) that it was actually a lime kiln. It’s all hands to the trenches now to finish digging and recording all of the features before time runs out. There are only a hand full of volunteers in the second trench now as most who have finished recording their features have moved in to trench 1. Trench 2 does seem to me to be very confusing with pits and ditches cutting each other all over the place – we’ll wait and see what the interpretation is for this trench. It the last day of digging at Tai Cochion for this year and luckily for us it’s another fine and bright day. 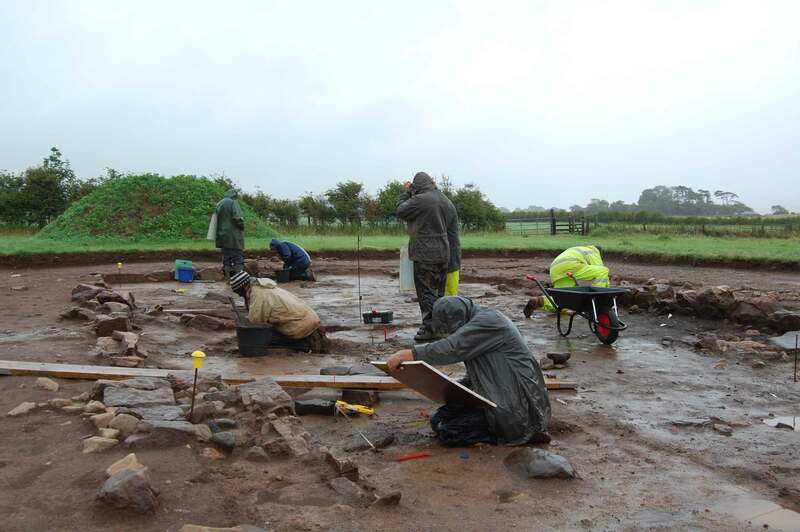 All the features in trench 2 have now been dug and recorded so everybody is working in trench 1. According to George (the trench supervisor) he thinks there are two main phases for the building. 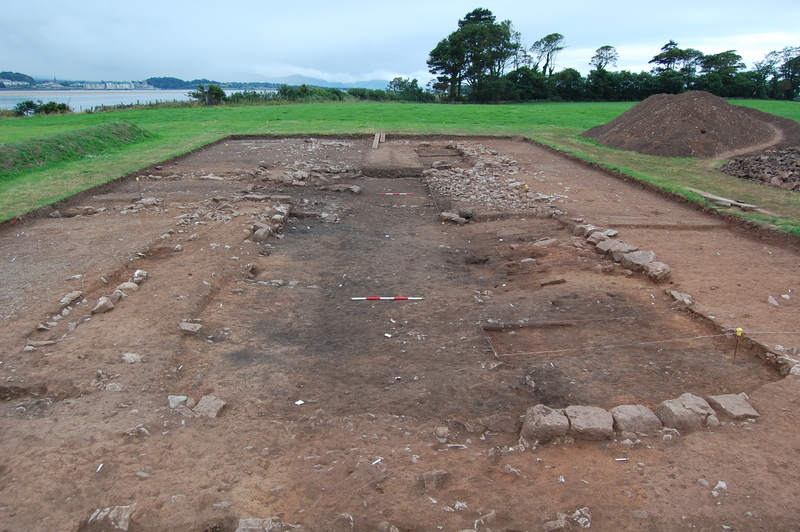 The first phase was as a corridor house, a high status Roman building, there is evidence to suggest it also had a veranda. The building then burnt to the ground but was later reused as a workshop or barn. Well, it’s officially the end of the dig! Gareth, one of the volunteers and a keen photographer, took a few group photos at the end of the day with all the GAT staff and the volunteers. Dave, George and a few volunteers are coming back next week just to tie up a few loose ends and to assist with the backfilling. It has been a fantastic dig to be involved with. We managed to get a one (wet) week extension to the dig. This gave us time to explore the earliest levels in the building. 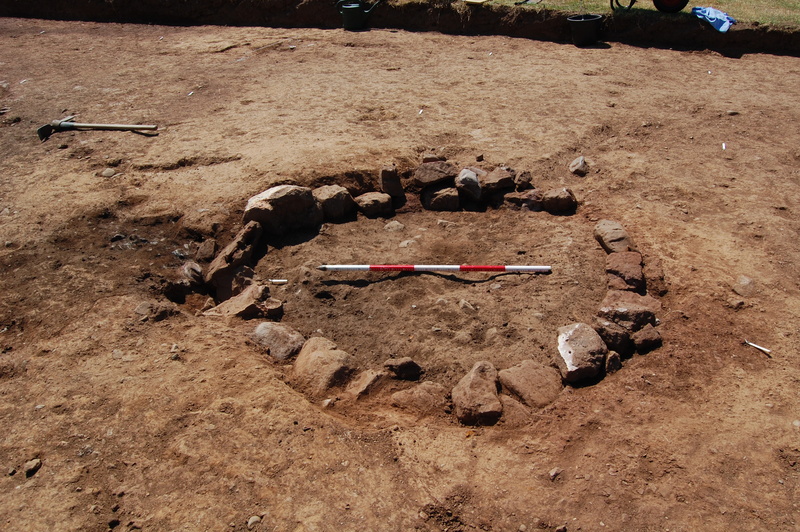 We found a metal-working hearth, several other craft working features, part of the original pebble floor surface and a spread of burnt Roman barley grains. Dave, George and the G.A.T. 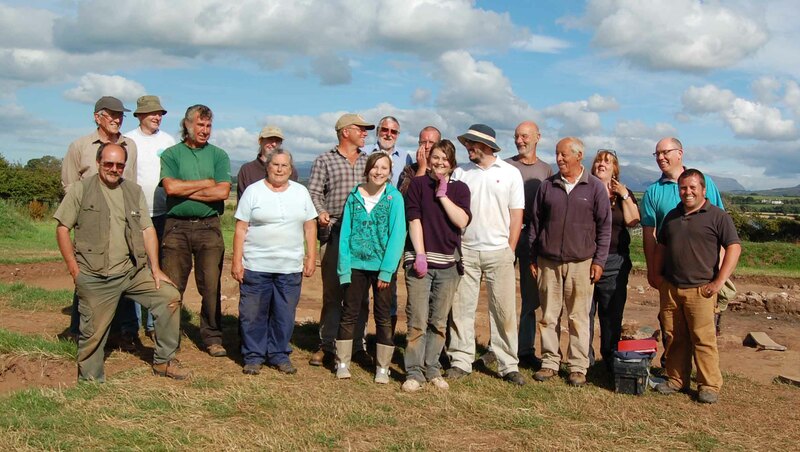 staff wish to thank all the volunteers who worked on the dig. This has been a really successful excavation and would not have been possible without the hard work, skill and enthusiasm of the Tai Cochion digging team. Many thanks are also due to Jack Roberts for permission to carry out the excavation. The site has been backfilled. We will now get started on the post excavation work. 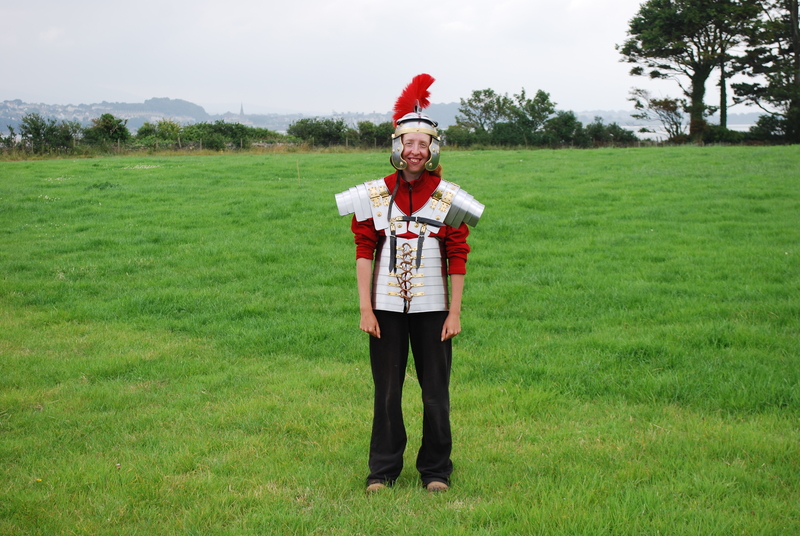 We have over 1500 finds to examine (all washed and catalogued on site by Sara Richards – many thanks!) along with lots of plans, photos and paperwork. There will be several months’ work before an interim report can be produced. Hi Meg, we’ve got room for one more! HI R DAVE! STEPHEN R HUGHES ERE! FINALLY SUSSED OUT ON HOW TO GET ONTO THE SITE. ARE’NT I CLEVER. IT ONLY TOOK ME 2 DAYS. C U ON MONDAY MORNING. which seems to explain a Gromar, far better than I ever could. Thanks for that – how amazing! I saw the dig sight from a rowing boat last Tuesday evening. Do you work over the weekend? I dont, but I cant speak for the Archaeology people here… Just to clarify, I’m not involved with this project, I’m just an amateur observer, who’s interested in the dig and the period of our history. Glad the link was useful! i finally found the site Dave, STEPHEN R HUGHES. now i can show people what im doing all day. exellent site by the way. theres no pics of me though? sorry Dave but i wont be able to come in tomorrows open day. C U ON MONDAY MORNING THOUGH. C U L8R Dave, Stephen R Hughes. Great Open day on Saturday!